Let’s say, the phone rings. You answer the phone but actually you can’t talk to the person right now because you’re busy doing something. What would you say? Actually, this happened to me a couple days ago. My niece called me when I was cooking caponata for dinner. The beauty of this phrase is that you don’t have to say what you’re doing if you don’t want to. 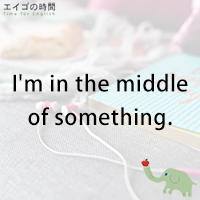 If you do want to specify what you’re in the middle of, you can. For example, I’m in the middle of cooking dinner. I’m in the middle of a meeting. I’m in the middle of a gym battle, and so forth. Now let me give you a quiz to make sure you get the phrase right. You’ll be given three options. Please listen carefully and choose the one that is TRUE. Ready?